This trail begins at the pier and goes through a cedar forest and ends at the Old Presque Isle Lighthouse. The trail portion is free, but if you want to visit the Old Lighthouse, there is an admission charge. Of course, walking the Harbor pier is also available. After your hike you can get an ice cream cone at the Portage or Pizza shop at the Harbor. Trails can be found on either side of the New Presque Isle Lighthouse. The trails follow the Lake Huron Shoreline. There is an admission charge to climb the Lighthouse tower, but admission to the museum and museum store are free. Three trails can be hiked, ranging from 1.4 to 2.6 miles and covering 7.5 miles of Lake Huron Shoreline. Park your car at the trailhead off of U.S. 23, about 3 miles north of County Road 638. February 10, 2012, the State of Michigan granted Rockport state park status making it the 100th state park in Michigan. With over 4,237 acres of land and miles of Lake Huron shoreline located in Alpena and Presque Isle Counties, here’s what the DNR website has to say about our newest park. “Rockport State Park offers many unique and special features. 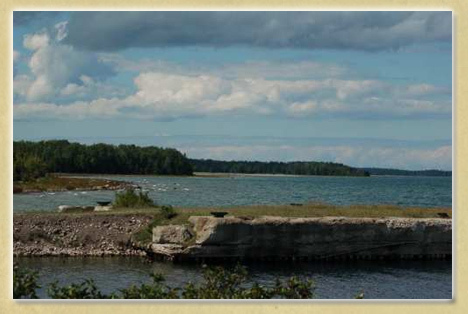 With 4,237 acres of land located on the shores of Lake Huron, north of Alpena, the property includes a deep-water protected harbor, an old limestone quarry of approximately 300 acres, a unique series of sinkholes, a dedicated Natural Area (Besser Natural Area), and a broad range of land types, vegetative cover, cultural resources and recreation opportunities. At the harbor, the Department has a boat launch facility, and there is a small park developed by Alpena Township on land leased from the State”. Fossils are abundant in the former quarry originally owned by Kelly’s Island Lime and Transport Company. There is an underwater spot where water from underground river can be seen billowing through the sand. Several ship wrecks can be found off-shore in the Thunder Bay National Marine Sanctuary including the Portland and the Portsmouth. There are streams and amazing, rare wildflowers such as the Dwarf-lake iris, Pitchers thistle, and Houghton’s goldenrod. Recreational opportunities are boating, deep water port, scuba diving, day-use picnic area, hiking trails, swimming, biking, fossil hunting, fishing, hunting and trapping, mushroom hunting, freighter viewing, Middle Island Lighthouse viewing, snowmobiling, and long-range shooting, rifle siting and target practice. Current access is by Rockport Road from US-23 or a trail from Besser parking area (a former railroad) that leads to Lake Huron and several sinkholes.